My wife and I have been making granola over 12 years. Sometimes it turns out really good and other times it seems to be a disaster. My wife discovered a recipe that will never fail you as long as you follow a few rules that will make perfect home made granola every time. We like to have most of our ingredients like nuts, coconut and dried fruit added after the oatmeal mixture is baked because we don't like our nuts and fruit burned. Additionally, raw nuts and raw dried fruit are better for you. My wife found an incredible recipe on the Jupiter Moon Farm. It's not a recipe that you can while camping because it's time consuming. This is why it's called "Terribly Inconvenient Granola" recipe. Since I like to eat as much raw food as possible, this granola recipe is really not that inconvenient. My wife insists that we have to toast the sesame seeds. The taste is much better toasted. We changed some of the ingredients but have kept the basic framework identical so you can experience the incredible taste. Granola is very tricky to bake when you add everything together. The kitchen sink method will not work. The dried fruit will turn into burned fruit leather. The nuts will taste like French roast espresso beans. In other words, everything will be burned except the rolled oats. 12 cups organic oats. We buy our oats in bulk for Azure Standard. 3 cups of assorted raw (unsalted) nuts: I use whatever is in my freezer. Almonds work well, as do hazelnuts, sunflower seeds, pumpkin seeds, pecans, walnuts, even pine nuts. 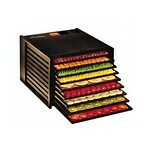 2 cups dried fruit: I like using fruits as opposed to raisins and currants. We use only un-sulfured fruits. My favorite dried fruit is dried cherries. Cut up dried apricot, mango, apple, peaches, nectarine, etc. 3 cups unsweetened coconut: My wife likes to use the large coconut flakes because the texture is wonderful to eat. I agree. 2 cups sesame seeds: Two cups. This may seem like a lot. This is the original author/creator's secret. She says "trust me, you need the sesame seeds". Grade B Maple Syrup: 1/2 cup is sufficient since the dried fruit gives this granola plenty of sweetness. 1/2-3/4 organic coconut or extra virgin olive oil. The original author is adamant about roasting all the ingredients in the oven separately. This works well and should be followed copy exact if you bake at 350 degrees F. However, in my own experience, I like to bake my granola at a very low temperature-200 degrees F. When I am patient, I will make it in my Excalibur food dehydrator. To properly make raw dehydrated granola, it will take at least 24 hours. It's not a hard process. We set the Excalibur's timer and let it run all day and night. When we bake our granola, we used aluminum baking sheets but never allow the granola or nuts to touch the baking pans. We bought Silpat reusable baking sheets from Amazon. They are non stick and made from silicon. Buy them once and take care of them and you will have them for a life time. Roast the nuts, seeds, and coconut individually on cookie sheets and bake at 200 degrees or less to keep the oils from burning. I will go for nutrition over taste. Toast the nuts until lightly brown. If you want to go the super healthy route like my wife, she soaks all the nuts and seeds and dries them in the food dehydrator. She sprouts the sunflower seeds for added nutrition and then dries them. Mix the oil and maple syrup together. Slowly add the sugar and oil mixture to the rolled oats. Make sure that the oats are coated evenly. Add a thin layer of the oat mixture to several baking pans and bake at 200 degrees F until lightly brown and crunchy. When the oats are cool, add the toasted nuts. Keep this granola out of plain view as it will disappear if you have kids or a husband who likes to graze in the middle of the night. Don't think for a minute that granola is a super healthy food that can be eaten all day. Use sparingly. We top a bowl of fresh fruit with a little yogurt and granola. 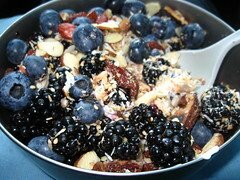 I will be posting a grain-free granola in the near future and I promise that you will really enjoy eating it. I think its muesli when it’s raw. I certainly agree with your wife about toasting the sesame seeds and I’d roast the nuts and grains as well. When proto humans tamed fire they were able to develop culture, society, etc. Since we don’t need night soil collectors and resultant fertilizer I think it’s better to have my food nourish me more than the local sewage.